Was definitely feeling it from yesterdays efforts, particularly the weighted squats, DOMS in inner thighs……that’s a good thing in my book by the way! 7 mile cycle to work got the blood flowing again. It wasn’t too icy either which was nice. I did double glove and double sock just to make sure though! A package arrived for me today……new shoes!! I love getting new running shoes, I have been wanting to get these since I saw them last year (just after I had bought my last pair!) so had to wait until I ‘earned’ them! They are perfect for me, in orange, the Dutch colour! So now Running Dutchie is complete. 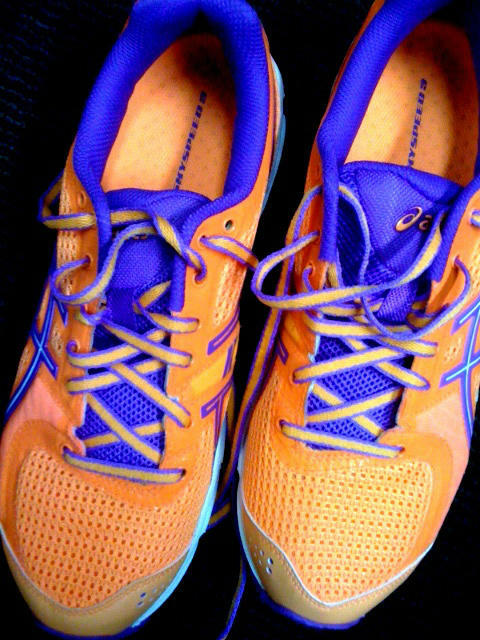 Keen to try them out, I ran home in them, took a different route through Manchester Centre City, so that added a mile on as well, so a nice 8 miles home. That was more than enough as could just feel my feet getting a tad sore, as they always are on run number 1. Then they will be aok from here on in. I did actually get around to printing my Runners World Smart Coach Marathon plan, considering I have signed up for Manchester Marathon at the end of april, I thought I had better get some structure going, though I will no doubt blast the mileage out of the water! Thats the plan anyway!!!! I saw you mention the Asics Smart Coach, and with your rather exceptional experience – would you recommend? I am pondering it for a marathon, with Hal Higdon being the other contender. Hi Ina, the smart coach was just a downloadable training plan which worked well for me when I was starting out, so yes would recommend it. I now write my own training plans so I can fit them better around my life and make them more specific to what race I am training for. But definitely a good tool to use. Good luck with the training.